Distance so far: 6582 km, -25 C, pitch darkness, stars. Just a few night time updates.. I had to strip right off this afternoon as the temperature on board my carriage was about 30 C. I was impressed that my carriage attendant understood how I felt and said he could turn down the heat, but I have only just worked out how. He has opened the roof panel above the toilet at the end of the carriage, stuffed a blanket inside and jammed the door open with the giant pair of chop sticks (actually used to unblock the toilet)..Somehow this is forcing cold air into the carriage as we move along. It’s a tad Heath Robinson, but seems to work so I’m not knocking it! Several carriages are either too hot or too cold – I’m lucky in that as the only passenger in this carriage I get to vote on the best temperature.. I also tested out my improvised “heat shield” today – this was a roll of tin foil gaffer taped over the radiator in my compartment. I thought it was a good idea, but it has made no difference at all. Back to the Trans-Siberian drawing board! On the subject of heat shields, I can see sparks flying past my window tonight, so our boiler is either working too well, or we on fire at the moment. 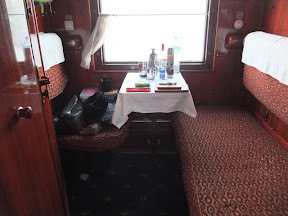 I had dinner in the restaurant car (with Stephan the German) tonight – Solyanka followed by a pork escalope with fried potatoes and a couple of beers – 1000 Roubles (£20). For some reason they were closing at 20.00 Moscow time, no idea why.. We have also run out of Baltika No. 7, so I have switched to Baltika No. 3. 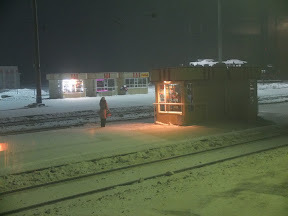 You can always hop off and go shopping on the platform – a scene here of the station supermarkets of Novosibirsk! You might be relieved to know that the flood in carriage No. 7 is now under control. I think the toilets are closed and the samovar is out of order, but the guys with screwdrivers are still hard at work. I’m worried that I have been rumbled on the “secret key” but I’m using the language barrier to cover my tracks. Guard B (there are two of them working shifts, so A and B) was puzzled how I unlocked my compartment without his help. A schoolboy error on my part.. in passing I prefer Guard A – he’s more of a fun guy, but both seem highly efficient. The local time zone is beginning to be a problem.. This afternoon it got dark at about 14.45 Moscow time. I have decided to start moving my watch towards Mongolian time (+4 hours, GMT +8) but this means working in both Moscow time (on which the train works to) and my own time zone – hopefully it will work, but it means an earlier start tomorrow to make the most of the short day – I’m going forward 2 hours tonight then 2 hours tomorrow night so that when I get to the Mongolian border on Saturday I will be in the correct time zone and avoid a big jump..
Quite a few “Crazy Ivan’s” today – at the wrong moment (eating soup or crossing between carriages) its a potential disaster. I have no idea what kinetics cause this, but I’m not putting down my glass of Merlot tonight. I think that’s all for now. Oh, it’s a movie night tonight – “The Cassandra Crossing”. A classic train flick! A bit late to read this, but… I was in Cassandra Crossing. Originally a nice little speaking part, which was cut, leaving me a fleeting moment as the carriage is invaded by a giant steel girder. The bearded guy who was sitting beside me was Don Hodson (RIP), an Aussia actor (and music critic!) who played the Austrian officer in Donald Sutherland's Casanova… Sleep well.